Anneli specialises in helping leaders improve influence, engagement and professional impact. The more senior a leader becomes the more time they spend communicating, influencing and engaging others. Therefore a leader’s ability to read and understand the behaviour of others, adapt their leadership style accordingly, and build strong relationships at all levels, greatly impacts their ability to achieve results. Technical expertise is an expectation, but no longer a differentiator for leadership success. Executive presence, motivation and inspiration, and building buy-in of those around them will trump technical brilliance in a leader, every time. Research shows that people judge the messenger long before they judge the message and their judgements colour the way the message is received. Given that as humans we judge people instinctively on two measures – first warmth, then strength, a leader’s style - how they are perceived by those around them - needs to be both approachable and authorative. Leadership ability affects share price. Market analysts value effective leadership by awarding a ‘leadership premium’ of up to 15.7% of company share price for good leadership, and a discount of 19.8% for ineffective leadership. That’s a 35.5% variable controlled by leadership effectiveness. In a study of over 50,000 executives, the flaws most commonly tripping up leaders at risk of derailment were related to failures in establishing interpersonal relationships. Social intelligence (the ability to connect to others in a deep and direct way, to sense and stimulate reactions and desired interactions) was one of ten essential skills predicted as critical for the future workforce by the Institute for the Future for Apollo Research Institute in 2011. In a study of 60,000 employees, leaders were likely to be seen as great leaders 72% of the time when they balanced a task focus with a people focus (a sole focus on either aspect scored a rating of 12-14% only). inability to adapt to change or elicit trust. Managers account for 70% of variance in employee engagement scores across business units. Essentially the most effective interpersonal style is a flexible one. Leaders need to be able to read the needs of the person in front of them and adapt their style accordingly. Anneli specialises in helping leaders at various levels of flexibility, increase their behavioural range and ultimately their leadership effectiveness. She helps them move up the ladder below increasing their leadership reputation, employee engagement and company valuation, as they go. What leaders discover through the coaching process is that they don't need to become someone else. This is not about a personality transplant or perfect leadership. This is about increasing awareness, building flexibility and choice and becoming the best version of themselves possible. All a leader needs to succeed in coaching is commitment, coachability, clarity and courage. What does a typical client work on? Building an effective interpersonal leadership style is about understanding the leaders’ reliance on their credibility, likeability and how they use their power with others. Some leaders need help taking their foot off the brake (potential to derail) and others need help hitting the accelerator (fast tracking high performance). 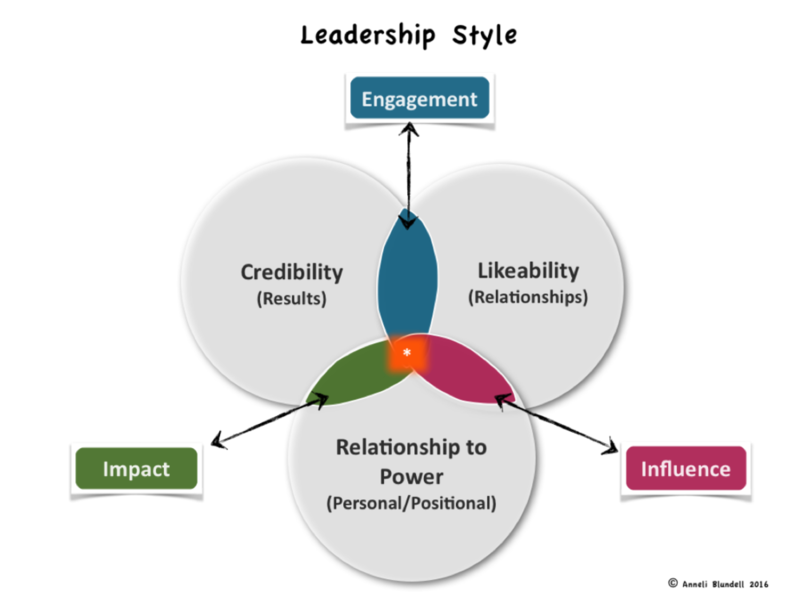 In both cases improving leadership style is a function of understanding and balancing three main levers: Credibility (strength) and Likeability (warmth) and Power (personal/positional). Over 90% of CEOs are already planning to increase investment in leadership development because they see it as the single most important human-capital issue their organizations face, but why choose coaching over other forms of leadership development? 86% of HR and business leaders surveyed by Deloitte, cited leadership as one of their most important challenges. Yet 50% of HR executives say their leadership development programs are ineffective or don’t provide significant, lasting benefits. Typically this is because the content isn’t specific enough and the training intervention doesn't last long enough. The typical organisation invests 85% of its resources in training events, yet these events only contribute 24% of learning effectiveness. Organisations only invest 5% of their time in training follow-up, even though follow up contributes 50% of learning effectiveness. Follow up typically involves some form of formal or informal coaching activity. Individual coaching enables the behaviour change intervention to be targeted, tailored and timely, three essential factors in creating sustainable behaviour change. Sometimes the development required cannot be adequately addressed in a group learning environment. The brain needs continued touch points over time, on-going reinforcement and practical application and review in order to embed new habits and new ways of working and thinking. Prepared to be direct without fear of political or career reprisals. Anneli favours the Inventory for Work Attitude and Motivations as way to gain insight into the intrinsic drivers of behaviour in the workplace. The tool provides a useful perspective for her clients to understand what drives them to act and communicate in certain ways, and how those behaviours and communication styles are perceived by others. I was skeptical about the value of coaching at first. I wasn't sure about sharing information or exposing my weaknesses, but have found it extremely useful. I had great feedback from my staff members that I have shown a considerable transformation since I started working with Anneli on my leadership skills. I've focused on listening more, asking more questions and showing greater patience. Coaching has also helped me understand myself and others better as well as helping me adapt my behavior depending on my audience. Self improvement looks to me like a never ending challenge, but I really feel great support from Anneli on that journey. Anneli’s coaching approach in first understanding and then applying effective leadership skills through self-awareness has led me to being a more effective leader. I've seen my decision making becoming more decisive and effective where I align it to my professional values. The time for coaching was just right for me. I treasure the coaching journey with Anneli through the guided conversations by being a fantastic listener, with a pragmatic approach on how to manage specific situations. From day one, I trusted her and after every conversation I felt empowered and energized as allowed me to discuss a wide range of thoughts and ideas with Anneli. On numerous occasions, Anneli went beyond the coach, was acting like a mentor providing strategies and lessons that help me in dealing with encountered matters. Anneli helped to build on my strengths and my confidence to speak up, was very supportive and taught me valuable advice through her deep and broad experience. I cherish the relationship we built through her positive attitude, un-biased lens and guidance. I will definitely work with Anneli again. I loved, enjoyed, treasured every single session we had together. I am grateful to Anneli and strongly recommend Anneli Blundell to anyone who is looking for a coach who can make a difference in your life! I have often thought about what coaching would be like and the value it would bring. Every professional sports player has a coach so why wouldn't we. I always had a feeling that my personal traits were deeply ingrained that they would be hard to change. But having that "someone else" outside of your work or social network that you can truly lay it on the line to, tell it as you see it and get some external advice was extremely cathartic. Anneli was a great listener, extremely empathetic and provided some great advice that matched my style and values. She definitely helped me understand it wasn't about changing myself or style but embracing and empowering my style. I believe it will have a long lasting effect, even after the last session. Thanks for helping Anneli! I feel like you were the right coach for me. My journey with Anneli has been extremely valuable to both my professional and personal growth. I looked forward to my monthly sessions with Anneli as she helped me navigate challenging circumstances and overcome my barriers. The outcome of each session led to a different learning experience. I particularly value Anneli's insight to human behaviours and she is definitely a people whisperer. The impact of my professional coaching can be seen more holistically in my personal life as well. Anneli takes a genuine interest in the personal growth of her clients and I cannot recommend her more highly. I knew I wanted to work with Anneli after attending a workshop on empowering women that she ran for the Victorian Government with a great deal of enthusiasm. I was very keen when the opportunity arose through a leadership development program at work to do more work with Anneli through professional coaching. Professional coaching triggered some emotions and raised issues for me that had been deeply buried inside for a long time, and I found Anneli was a trusted, non-judgemental guide to supporting my journey of self discovery and awareness. She also was able to challenge me in a way that was professional, respectful and honest. I would recommend Anneli to anyone who is ready to undergo a level of transformation professionally or personally. I have been working closely with Anneli Blundell - Executive Coach for over 12 months. Utilising Anneli’s executive development and coaching expertise helped create a personalised learning framework which has enabled me to expand my leadership capability incrementally, and yet maintain the focus on taking my broader team on the same journey. Anneli offers a unique and powerful solution to leadership development through a variety of coaching tools and insights. Anneli’s professionalism and dedication to her coaching discipline has been incredibly valuable to me and my organisation. This coaching program provided an opportunity for me to reflect and focus on what will create the most leverage in my life and business. Anneli’s coaching approach unlocked and expanded paradigms that enabled phenomenal personal and professional growth. The experience was about building, developing and applying effective leadership skills through self-leadership and enhanced self-awareness that led to clearer and more effective decision making that totally aligned with personal and corporate values. To date, my work with Anneli has been a motivational and inspiring experience and I would recommend Anneli to any executive wishing to expand and stretch their own or their team’s leadership capability. I had the pleasure to engage Anneli to provide communication coaching. It was possibly the single most important personal development I've received in my career, and was delivered with incredible skill, patience and thoroughness. I found the coaching with Anneli was incredibly thought-provoking and fascinating. The way that I was stretched to think about things that I've not considered before was very positive and I am very satisfied with the outcomes that were achieved. Anneli took great care to understand my particular issues, and aligned the coaching specifically for the results I needed - it was a thoroughly professional engagement. Many thanks for your time and support along my journey so far. Your challenging questioning methods and supporting behavioural modelling has provided a safe and supportive environment for me to analyse my operating model and to take on board courage experiments to change what was comfortable. Over the course of my sessions I made a bold step to change my career direction and to take on a role in a new field and to pick up line responsibility for staff. The coaching sessions have guided me in establishing a high trust base with my DR’s and to set operating guidelines in the form of psychological contracts between myself and my team members. My only constructive criticism of the process has been that 4 sessions have flown by and whilst we have achieved a lot during this time, I hope that future coachees of the Telstra Top Talent program are able to spend more session time with quality coaches like Anneli. A well worthwhile experience that I thank Telstra for allowing me to participate in. Cuddy, A. J., Kohut, M., & Neffinger, J. (2013, July-August). Connect, Then Lead. Harvard Business Review . Retrieved from: https://hbr.org/2013/07/connect-then-lead/ar/. Davies, A., Fidler, D., & Gorbis, M. (2011). Future Work Skills 2020. Retrieved from www.iftf.org. Van Velson, E., McCauley, C. D., & Ruderman, M. N. (2010). The Center for Creative Leadership: Handbook of Leadership Development. San Francisco: Jossey-Bass a Wiley Imprint. Horwitch, M, & Whipple, M (2014, June). Leaders who inspire: A 21st century approach to developing your talent. Kirkpatrick Ph.D., J., & Kirkpatrick, W. K. (2009, April). The Kirkpatrick Four Levels: A fresh look after 50 years 1959–2009.